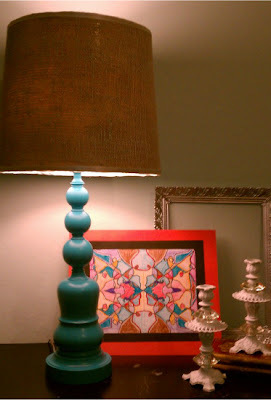 Lori from Bleak2Unique gave a pair of dated brass lamps a breath of new life a snappy coat of blue paint. Click on the picture below to see the full how-to! Lori is a southern girl who loves to find trashy treasures and make them uniquely new. Crafting, DIY projects and family is what she does, and she loves to share her ideas, listen to your ideas, and together find the simple joy of "home". Chat with Lori in your favourite way. Brandi from His Shabby, Her Chic transformed a plain Jane Ikea rug into a stripey masterpiece with the help of a little paint. Click on the picture below to check out her method. Brandi blogs at His Shabby, Her Chic. She moved into man's bachelor pad 2 years ago and they’ve been making progress towards making his house their home. She enjoys all things crafty, décor, and of course loves her dogs, Bot & Izzie, beyond all reason. Join her on her journey of turning this boring old house into a home.